What makes a Classic Pick? 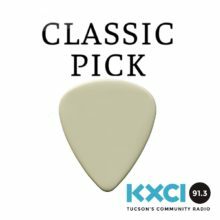 The Classic Pick is a weekly feature at 4 p.m. Monday-Friday on The Home Stretch, sponsored by the Good Oak Bar and curated by Kris Kerry. Each Monday at 4 p.m. Kris stops by KXCI’s studio to give us insight on this classic album at 91.3 FM and KXCI.org.